Since sacred natural sites hi the conservation agenda in the late 90-‘s they have been receiving increasing attention from conservationists. In 2008 at the IUCN World Conservation Congress in Barcelona the launch of the IUCN UNESCO Best Practice Guidelines “Sacred Natural Sites: Guidelines for Protected Area Managers” marked a sea change in terms of their recognition. Book Launch: Asian Sacred Natural Sites: Philosophy and Practice in Protected Areas and Conservation. 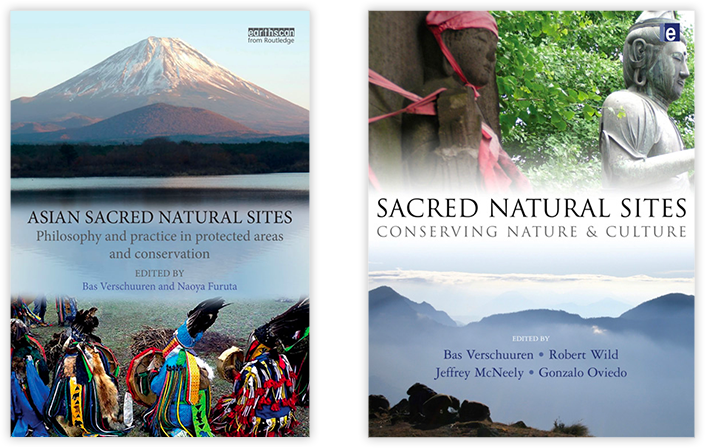 A co-publication of Sacred Natural Sites Initiative and Biodiversity Network Japan. Saturday the 3rd of September, 13:00 – 14:00, Room 318A. Verschuuren & Furuta (eds) 2016. Asian Sacred Natural Sites: Philosophy and Practice in Protected Areas and Conservation. Routledge, London. Workshop: Cultural and spiritual significance of nature in the governance and management of protected and conserved areas and World Heritage Sites. Monday, the 5th of September, 8:30 – 10:30 am in Room 315. The session ID number is #WCC_10211. Still looking for more ways to engage with sacred natural sites? See how they play a role in some of the thematic journey that have been organised to help lead people with a specific interest through the congress. Try the journey on conservation and spirituality with a high level segment involving representatives of the worlds main religions or the “Nature Culture” Journey that will advance effective conservation practice through integration of nature and culture.